Let’s face it – the holidays can be a crazy time. We all need more help during the holidays. They are full of family, fun and excitement but also full of longer to-do lists, special meals to make, people to entertain, gifts to choose and money to spend. Whew – just thinking about all of that can be intimidating and overwhelming. It’s important to have support, encouragement and help from our partners all the time but it can be even more important during times of increased stress and demands. Sometimes we bark orders in frustration or it we think, “I can do this better, faster, easier if I just do it myself.” It’s important to ask for help in a productive way but that’s not always an easy thing. People struggle to ask for what they need for lots of different reasons. Some fear of being told no, being judged or being rejected. Some people feel guilty or ashamed if they have to ask for help. Others are people pleasers and feel the need to “be perfect” and have it all together. Women report more stress during than holidays than men and tend to feel like most of the pressure falls on them to plan and prepare for festivities or travel. Regardless of your gender or the pressures you feel – everybody needs something. 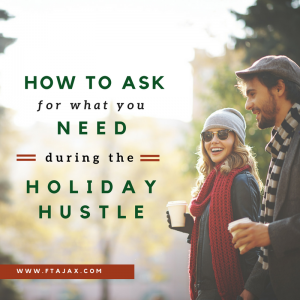 Tell yourself you deserve to enjoy the holidays too and it’s okay to ask for what you need. Here are four common things we think people need more of during the holidays and how to ask for them. There’s simply more to do during the holidays. There is still work, kids, chores, errands and life demands in addition to holiday decorating, entertaining, shopping and planning. No one can do all of that alone. Don’t be afraid to ask your partner for help. Decide which things you can let go of and allow them to help you with those things. You’ll be less stressed and feel closer when you operate as a team. I need some time by myself. We all need a break. Whether your thing is running, yoga, Grey’s Anatomy, sports, reading or spending time with your kids or friends – you need time to do the things you enjoy. It’s okay to check out for a bit, your to-do list can wait. Chances are if you make time for yourself to recharge, you’ll approach your tasks with a renewed energy and clear mind. Stress of any kind can really wear on your ability to effectively manage your emotions. The more stressed you are the less tolerance, grace and patience you have. We all need support, sometimes we need it more than other times. If this is one of those times for you, reach out to your partner. It can be helpful to say, “I’m really stressed right now. Would you mind sitting and talking with me, giving me a hug, reassuring me, etc.” Be clear and specific in what you ask for, don’t leave them to guess. I need some alone time with you. Whether you’re both stressed, you’re the one who’s stressed or you’re watching your partner suffer from stress – it can wear on your relationship and leave you feeling lonely. It’s important to make time to connect with your mate all year around but it can feel more difficult to make time when life is hectic (ahem… during the holidays). Make a plan to spend some intentional time together – schedule a few date nights to get you through the holidays, take 10-15 min at the beginning or end of each day to have coffee or hot chocolate and check in with each other. Plan to get away for a night or plan a romantic vacation together to unwind after the holidays. Our Luxe Couples Retreat may be the perfect option to destress after the holidays and recharge your relationship. There is so much to see and do during the holidays. It’s no wonder people find it to be one of the more stressful times of the year – but it doesn’t have to be. Whether you’re a planner or just get caught up in the moment, take some time to consider what would be helpful to you. Write those things down; then go ahead and ask. Research also shows that people tend to underestimate other’s willingness to help. This means people want to help you but you’re unlikely to get the help you need if you don’t ask! Ask for help during the holidays. If you find that you tend to struggle throughout the year with being assertive about your wants and needs, our team of therapists would love to help you find your voice and get your needs met. If you’re ready to get started, click here to schedule your appointment today.